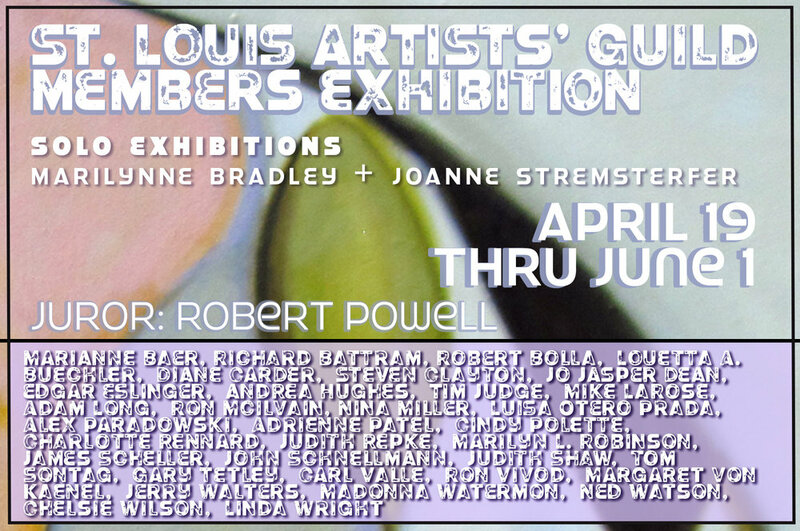 The St. Louis Artists Guild announces an all media, all content juried exhibit for their members working in a diversity of mediums. We are proud to announce our juror Robert Powell founder and Executive Director of Portfolio Gallery and Educational Center. As part of this exhibition the St. Louis Artists’ Guild presents two solo exhibitions by longtime STLAG members, Marilynne Bradley and Joanne Stremsterfer. Robert A. Powell is founder and executive director of Portfolio Gallery & Educational Center. Powell brought Portfolio to life in 1989. Ten years later, he was one of only 19 non-profit leaders selected nationwide to become a Fellow in the first class of The Denali Initiative, which provided training over a three year period to develop “social entrepreneurs.” The Initiative emphasized providing community services in exchange for dollars, rather than relying entirely on the community to support a cultural service. In addition to his business acumen, Powell brings is a passionate artist and dedicated educator. As an artist he is a recognized sculptor whose works are in the permanent collections of Nerman Museum of Contemporary Art and the Johnson County Community College in Overland Park, Kansas. In 2008, he was selected to design an ornament for the White House Christmas Tree in celebration of the “Red, White and Blue” Christmas holiday. Robert A. Powell, the educator has a B.S degree in education and taught for more than a decade in the public schools of Oakland and Kansas City. It was in Oakland he moved his industrial arts students into the realm of three dimensional sculpture, carving and creative art works. It was also there he developed his own artistic philosophy about the positive. For Powell it all starts with the magic number one, one person, the one man or woman in the mirror.